The ultimate existential minimalistic low resolution freeware boredom simulator! Have you ever wondered how does it feel to be Agustín Cordes – the award winning game developer of an extraordinary game called Scratches and an upcoming masterpiece Asylum? Well – now you can. 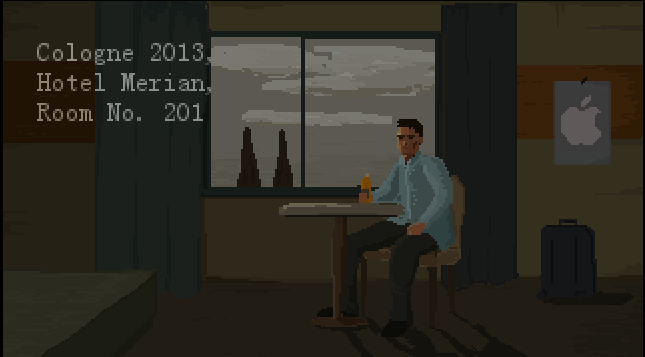 In the game you assume role of the titular protagonist, who is stuck at the hotel room while waiting for his friends to arrive. Having a bottle as his only companion, he sinks deeper and deeper into boredom. Then, suddenly, things start to happen. The game has been created in mere two days during GamesCom 2013. Are you prepared for a real boredom? Then download the game for free here!